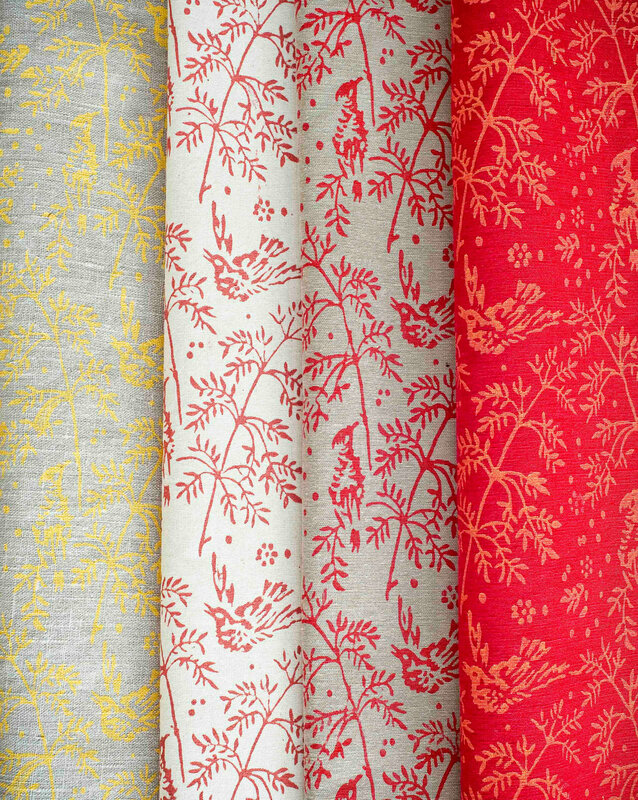 Wallpaper is also very expensive – fabric more so, and not as forgiving. 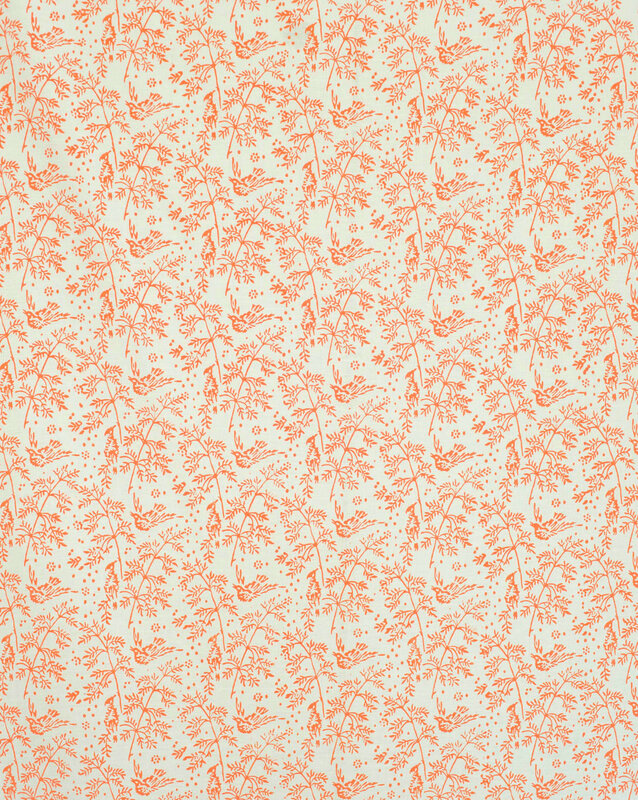 My mother hung fabric on the walls in our house growing up, but didn’t have a problem (that I know of) even with putting it in my brother’s room when he was a child. 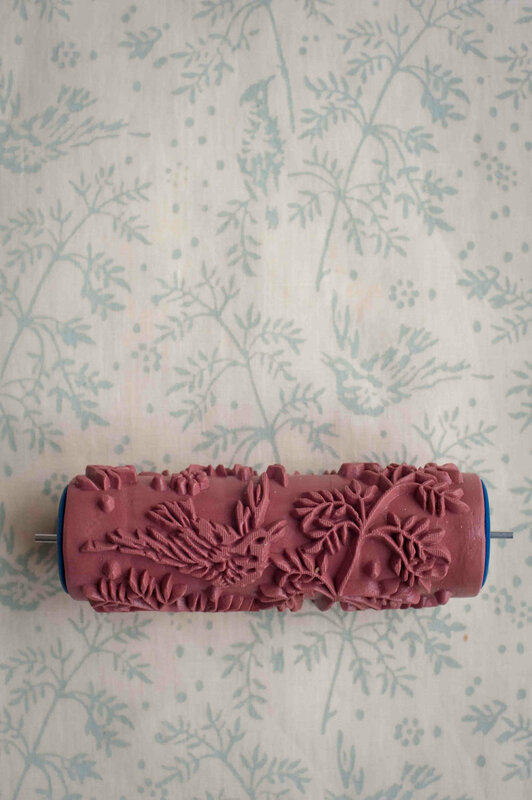 Enter a product that has been used in Romania for over a hundred years as an alternative to wallpaper: a patterned roller. 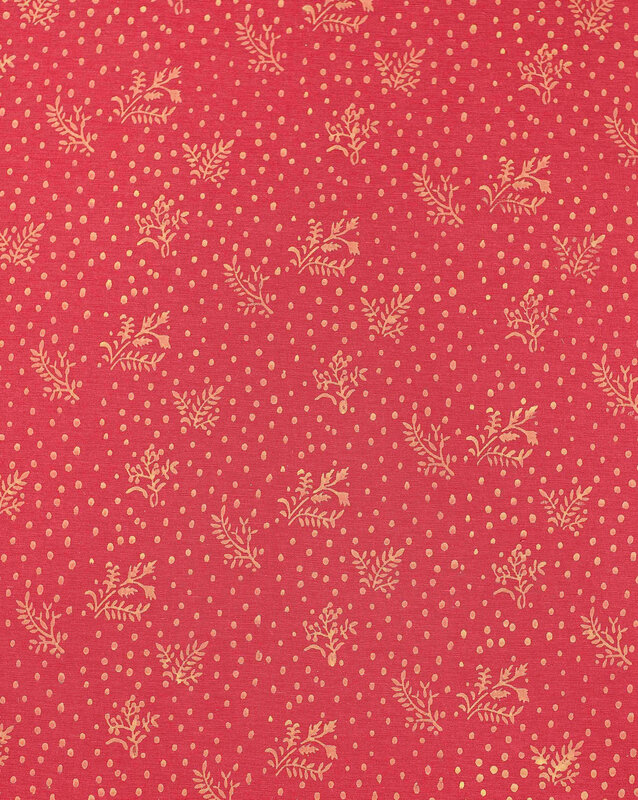 Available on Etsy and online, it can be used on fabrics, walls and paper (wrapping paper! ), giving a nice variation of applications. All of the pictures here used this product. Paint a colored background, use a different color for the roller and it looks very rich, like the first picture. Use a light background with a light paint for the roller and it looks more casual. I hope you have a weekend!! Parent-teacher conferences for me tomorrow!! 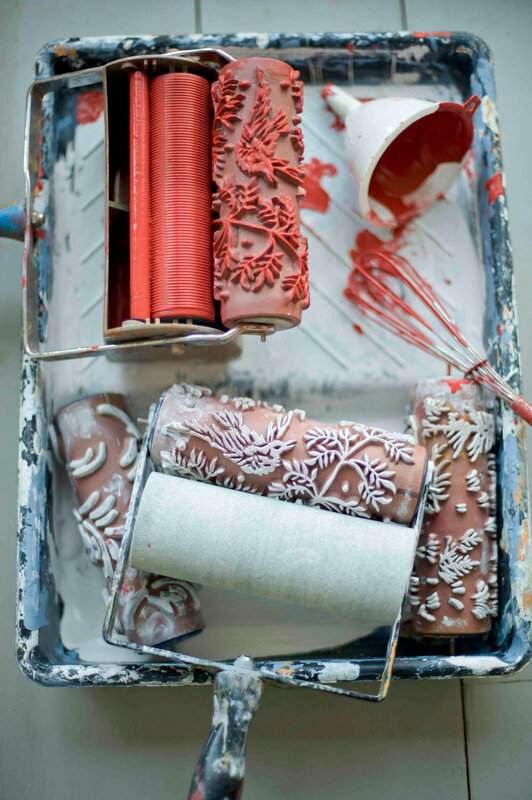 Beautiful, but wouldn’t you run out of paint and have a hard time lining it up exactly each time you touched the roller back to the wall? Oops! I see now that it is adding more paint to the pattern as it rolls around each time. What an awesome alternative! I’ve always liked wallpaper but would never put it up because it was so hard to clean with kids and pets. I also could never find the time to hang it . . . . I’m going to have to try this in my new home office. I love it! Trying hard to persuade the husband (he does the decorating- doesn’t trust me, rightly) but he’s not convinced. There are always stencils – just beautiful ones – and you can put as little or as much pattern on as you like. When I have some time to research them, I’ll do post on stencils…. I am right there with you – on all your points!! SO interesting! I totally love this idea! Super pretty. Those are super cool. I am already strategizing where and how to use them…what with the influence of Home Improvement Television, it is a wonder that anyone even sells blood-red paint, wallpaper, or ceiling fans with tulip light fixtures anymore. Love this! I’m usually more of a solid color person, but lately I’ve been getting into patterns…thanks for this! 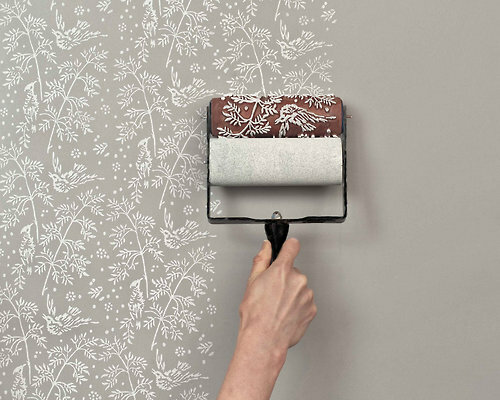 I’ve always done my own wallpapering & just assumed they were all strippable (ok, not a word, but meaning you pick off a corner & the entire sheet comes down). That is until I wallpapered the kitchen with paper that wasn’t. And did I do a very fine job of putting it up there…until I didn’t want it there any more. I spent the entire summer picking off little 2″ pieces, spraying w/fabric softener, sanding, getting a little frustrated & putting some good sized dings in the walls, then having to patch with joint compound & re-sand. Then I finally got to the painting. Now I’m looking at the dining room & having to remove the paper on the bottom half under the chair rail. I was thinking about putting paper back up again, but now you’ve mentioned fabric & I’ve just got to look into that. I’m trying to imagine putting it up without having glue come through so that needs some research. But this looks like another great solution – I really love the gray with the white pattern on top. Very rich looking. Oh & Kitchen Place adventure #3 tomorrow. Woman designer so hopefully I won’t be dealing w/some guy who fancies himself a gourmet cook who knows all about how he likes his kitchen set up. Sigh…. That is super cool!! First time i have heard of them, have your tried them out in your house? This is a really cool idea! I’m going to keep this in mind when I move to a new house in 2 months. This would look gorgeous on the wall behind my bed. My one fear would be that my unsteady hand might create a slant! Have you had that problem? This is fantastic, but the patterns are limited. What do we do to let the company produce more patterns?